Feature image: Dell Medical District at University of Texas at Austin. Recently, we explored how SITES pilot projects optimized sustainability and fostered resilience by implementing both SITES and LEED. Originally modeled after LEED, SITES was developed to fill the gap in addressing site sustainability. In 2015, GBCI acquired the SITES rating system and started administering certification as part of its strategy to ensure that the sustainability movement addresses all areas of the built environment. The SITES rating system was developed to elevate the value of landscapes. Too often, a site is seen as an afterthought—something to be altered and shaped once elements like buildings and roads are finalized. However, unlike buildings, which typically depreciate, high-performance landscapes appreciate by continuing to provide a variety of benefits such as managing stormwater, cleaning air, sequestering carbon, regulating climate and providing habitat for wildlife. Sustainable landscapes can also create ecologically resilient places better able to withstand and recover from floods, droughts, wildfires and other catastrophic events. In addition, a growing body of research is revealing the benefits people derive from being in nature, such as improvements to cognitive functioning, decreases in anxiety and stress levels and increases in productivity. To encourage this integration of built and natural systems, GBCI has identified the synergies and equivalences between LEED and SITES. To further streamline this process, GBCI now awards all the Sustainable Sites (SS) credits in LEED v4 BD+C for a project that achieves SITES Gold certification or higher. When the SITES v2 Rating System was released in 2015, it was quickly adopted by the U.S. General Services Administration (GSA) for their capital construction program. “Our incorporation of the SITES certification program provides an added focus on the quality of our site development, clear performance standards, and third party verification; all of which help GSA meet its sustainability goals and ensure accountability in the actual performance of delivered projects,” notes Christian Gabriel, GSA’s National Design Director. In addition to SITES, GSA also has a minimum requirement of LEED Gold for new construction or substantial renovations of federally owned facilities. As of June 2016, GSA has accumulated 154 LEED certifications, including 49 LEED Gold and 10 LEED Platinum projects, totaling approximately 44.6 million square feet, or 24 percent of its portfolio. 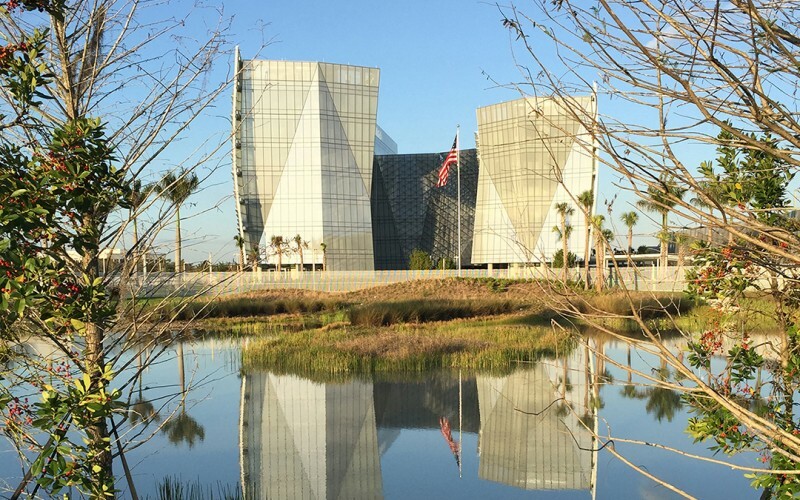 SITES-certified federal office building in Miramar, Florida. GSA embraced SITES during the pilot program, certifying a federal office building in Miramar, Florida, and a federal courthouse in Albuquerque, New Mexico. With the 2016 adoption of SITES, GSA is developing nearly 25 major capital construction projects, ranging from federal courthouses, buildings and laboratories, to data centers, archival records complexes and land ports of entry. In November 2017, the 14-acre Dell Medical District at The University of Texas at Austin (UT-Austin) became the first project to hold SITES, LEED, and PEER certifications, making it one of the most holistically sustainable and resilient facilities in the world. Jim Walker, director of sustainability for UT Austin, spoke about campus transformation at the recent Greenbuild conference in Boston. “UT-Austin is pursuing SITES certification because it is only through discussion of challenges and solutions, documentation of effort and investment, and certification of results that UT will know whether a project has truly met our sustainability goals and standards,” he said. According to Walker, choosing SITES was essential to completing the vision for the district and restoring the urban creek that flows through the middle of the project.